He has been a top rated certified official in Karate for AAU, USNKF, and PUKO for over 40 years. He served as a member of the Education Committee, the Dan testing board, and is presently a Senior Caucus Member of the National Karate Federation. Master Bill Marcum, a 9th Dan in Isshinryu Karate, also holds Shihan ranks in Judo ,Ju Jitsu, and Kobudo. Master Bill Marcum has taught Isshinryu Karate in his dojo for over 30 years in Kent, Ohio. Along with his wife, Roxanne, they hosted the 5th IWKA Championships. He also conducts seminars, serves on committees, gives demonstrations, teaches at summer camps, and officiates in tournaments throughout the USA. He has truly excelled in the martial arts, for which he has great respect. He has done this with integrity, professionalism, and the utmost humility. Master Roxanne began training in Isshinryu Karate in 1970 while in college at Kent State Universtiy. She started her training in the KSU Karate Club under Sensei J.H.kim, a student of Sensei Harry Acklin. She became the first female to earn her black belt in the club. In 1970 there were very few females in the Karate. At this time females in the martial arts competed in one division. So white belt to Black belt competed together. She hold 8th degree under Master J.H. Kim and Master Bill Marcum. Started karate in 1970; 48 continuous years in Isshinryu Karate. Roxanne encouraged the females in the Karate School at Kent State University to compete and eventually there were enough to have divisions at different tournaments. During this time Roxanne would compete with the men in order for the other females in the School to be able to compete among each other. 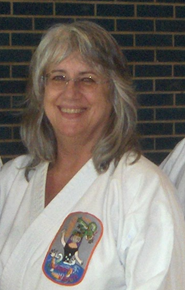 Roxanne is a competitor and Instructor who has traveled to many states teaching and promoting Isshinryu karate. As a certified educator and a Masters in Physical Education from KSU she is uniquely qualified to understand how the body works and the best methods to motivate students to accomplish their goals. She has taught Isshinryu to hundreds of students in Ohio and many more around the country. She has competed and taught in Michigan, New Jersey, Pennsylvania, Indiana, Maine, Tennessee to mention a few. She is a strong believer in developing the basics and in helping students understand how to use their bodies to get the most out of each technique in basics, kata, kobudo and kumite. Master Marcum also began an all-female Karate School on campus to help the women gain much self-confidence and to build their skill. In this way she was a Pioneer for Women in Karate by developing skills, encouraging participation in karate, promoting karate for women, helping women how to defend themselves and to be confident, and teaching women how to compete at National levels. She successfully competed and medaled in local and national levels of competition in Kobudo, Kata, and Kumite for 40 years and held titles of National Champion. She was awarded the All-American Award after winning the AAU Nationals in weapons; She was the only Female Isshinryu member of the first female members of the United States Karate Team Pool. She introduced Isshinryu into other organizations: AAU, USNKF. The organizations at this timee were Japanese Karate styles and not Okinawan. Through her efforts and skills she demonstrated the strength of Isshinryu in Kata, Kobudo and Kumite and won recognition for Isshnryu karate inspiring more isshinryu competitors to compete in these organizations. She was the first woman to get AAU National Referees License A. She was also one of the first people in the area to be certified as an AAU official in the 1970s and had the honor of being the First Female Referee chief referee for the Junior Olympics competition in New Jersey. She was also one of the instructors for Master Kim’s Kent State University Karate Club during the early 1970’s. Master Marcum was also a professor at Kent State University where she developed and taught the first accredited isshinryu karate classes. As well as teaching Isshinryu Karate and Self-Defense, she also taught Tae Kwon Do at KSU. During this time she also taught for Pro Am Karate Studios. Roxanne has developed seminars for mixed groups and women at Marcum’s Martial Arts Academy, for Sororities on KSU Campus, for Dorms on the campus, and for local groups. Additionally, Master Marcum taught karate at the University of Akron. She continues to develop top competitors and is recognized for developing many fine students who have done extremely well in competition locally, nationally and internationally. In addition to teaching Isshinryu Karate at Marcum’s Martial Arts Academy, she conducts special training classes for competition. Induction into the USA Karate Federation Hall of Fame for being an accomplished athlete and an accomplished Referee. Induction in to Nagel Hall of Fame,INC AOKA. Co-Host of the IWKA Championships 1989 bringing Master Kichiro Shimabuku to Ohio for the first time. Holds dan ranks and trains in other martial arts systems. Taught seminars in many states of many topics in karate. Traveled to tournaments to compete, officiate and to conduct seminars to support and promote isshinryu over the last 48 years. Jamie started with Marcum's Martial Arts Academy in November 2000 and received her Sho Dan in January 2007. Jamie has been assisting with classes since 2003. She is currently the rank of Yon Dan. Jamie was named the Women's Kata Grand Champion in the 2009 and 2015 IWKA championships. She also won the Kata and Weapons Grand Championships in the 2016 and 2018 OIKKA tournament. Along with teaching children’s karate classes at the dojo, Jamie instructs students through the Kent Parks and Rec karate program and assists with women’s self defense classes. In addition to karate, Jamie studies Kung Fu, Tai Chi, and Jodo. Katherine started with Marcum's Martial Arts Academy in the fall of 1984. She graduated from Oberlin College in 1993 and Kent State University in 1996. Katherine received her Sho Dan in 1989 and recently her Ni Dan. For the past year she has instructed karate classes at Menlo Park Academy during their elective and after-school programs. In 2011, she received three first place trophies at the Isshin Ryu World Karate Association Tournament. In 2012, Katherine was awarded Grand Champion in the Orwell Tournament in Orwell, Ohio. She also is an assistant instructor for the children's classes for the academy. Living in Brooklyn, NY now, William Hoffman began studying at Marcum's Martial Arts in the summer of 2005 at the age of 13 and has since attained the rank of San Dan. Between attending classes at Ohio University, living in Cleveland, and eventually moving to New York, he has continually returned to the dojo to learn and often compete. He also studies at Brooklyn Aikido Center: Hoshinkan Dojo under Sensei Seth Giammanco. In his capacity as a business journalist, William is an editor at Auto Finance News. Carmine began his training in Isshinryu Karate in 1974 in New Rochelle, New York. While he was in high school he trained under the lineage of Master Don Nagel, Hanshi Nick Adler, and Sensei Tommy May. He graduated in 1976 from Samuel Gompers High School in New York in Electrical Education. Carmine entered the United States Marine Corps in 1980 and graduated in 1980 with meritorious PFC. Next, he attended Mechanic School and graduated in November of 1980 as a trained Wrecker Operator. Carmine married in 1982. He and his wife have four children, 2 boys and 2 girls. In 1991 they moved to Ohio. Here he returned to his study of Isshinryu at Marcum's Martial Arts Academy where he received his Sho Dan. Josh began studying karate at Marcum’s Martial Arts Academy in March 2011 and has been assisting with the children’s classes since 2013. He is currently a Ni Dan. He participated and medaled in the 2013 and 2015 IWKA championships and the 2016 OIKKA championship. He was named the Men’s Kata Grand Champion at the 2017 IWKA tournament. Along with teaching children’s karate classes at the dojo, Josh instructs students through the Kent Parks and Rec karate program. Josh also studies Tai Chi, Kung Fu, and Jodo.